no mas pantalones: BustedTees "Super Nintendo, Sega Genesis"
BustedTees "Super Nintendo, Sega Genesis"
With skills unmatched by any rapper in the game today, I would definitely give up my Super Nintendo and Sega Genesis "to hear Biggie Smalls speak." I'm just not sure I can surrender my Atari 2600 that easily (I'm just playing y'all). 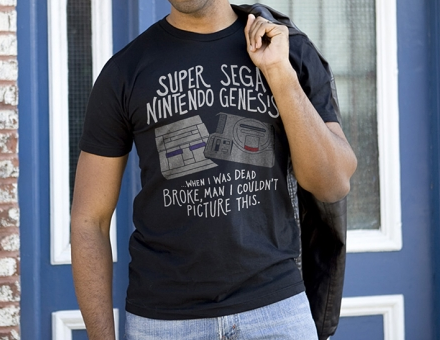 Honor this rap god in BustedTees "Super Nintebndo, Sega Genesis" t shirt, only $13 until Sunday, 11.10.13.